The harmonized scale, like the circle of fifths, is a wonderful, amazing and somewhat mysterious musical construct. If you don’t know or remember the harmonized scale let me review before I move on to how to use it for arpeggios. What is the harmonized scale? If you play those chords in sequence they sound really nice. But so what? Where did those chords come from and how do you use them? All of the notes for all of the chords in the harmonized scale come from the notes of the major scale it is harmonizing. The chords are built by taking the note which names the chord and then every other note of the scale for the next two notes (triads) or three notes (4 note chords). Let’s look at the C major scale. The first chord of the harmonized scale starts with C and contains the 1st, 3rd, 5th and (for 4 note chords) 7th scale degree notes. That is, every other note for a total of 4 notes starting with C. The chord, C, E, G and B is a C major 7. The second chord contains scale degrees 2, 4, 6 and 8. The 8th note is in the next octave and is the same as the 1st scale degree – but of course it is an octave higher. These notes for the key of C are D, F, A and C which are the notes in a Dm7. Using the harmonized scale for learning arpeggios. Now for the amazing use of the harmonized scale. 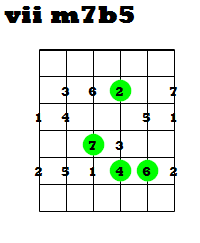 If you’ve learned the CAGED major scale positions from my previous posts (Major Scale Positions for Guitar and Arpeggios from major scales – Part 1) then you are well on your way to learning a bunch of major, minor, major 7th and minor 7th arpeggios. 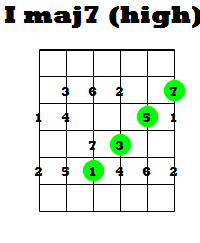 The important thing to realize is you can play these arpeggios knowing only the notes of the major scale. 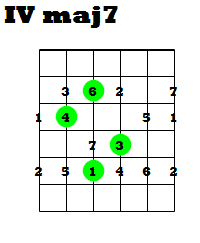 Specifically, you can play in any of the CAGED major scale positions and play each of the harmonized scale arpeggios. 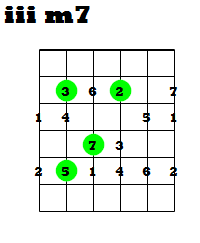 The following breaks down the finger positions for each arpeggio in the harmonized scale using the G cagEd form starting at the 6-2 position. 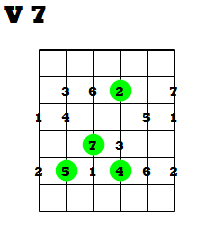 Although the diagrams are intended to be generic and could start at any fret, if you presume they start at the nut, then these would be for the G major scale. I’ve therefore put the G major harmonized scale chord names above the diagram and the generic name (using Roman numeral notation) in the diagram. 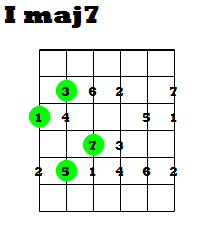 The scale degree of each note in the major scale are shown on the appropriate string/fret and the notes for the indicated arpeggio are highlighted in a green circle. What I’ve just presented may be a lot to take in if this is your first exposure to harmonized scales and arpeggios. My favorite position is the E form (6-2) for the major scale because it contains two complete scales and does not require stretching to reach any of the notes. My recommendation is to start with this scale and learn the 3 and 4 note arpeggios for the harmonized scale in this position. 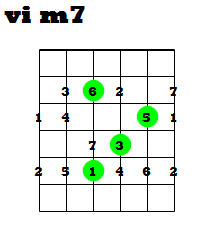 Once you feel comfortable with this, learn the harmonized scale arpeggios for the other four CAGED positions. As a bonus, I’ve put the above harmonized scale arpeggios in the key of G into tab. You can download the above tab as a PDF or in Guitar Pro formats (GP3 or GPX). 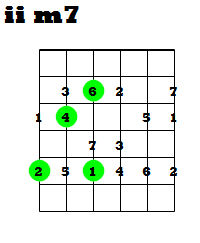 The files are named “g-maj-arp-E-form-6-2.” followed by the extension for the format. See the download page to download the appropriate version. Next Post:How’d I get that tab, notation and chord diagram into my blog?